Creation of the Sea offers to maintain every saltwater aquarium it installs in New Jersey, New York and Connecticut, which is highly recommended to ensure the health and longevity of the aquarium’s ecosystem. Aquarium service is provided on a bi-weekly basis, with weekly maintenance available for complex applications and/or customers in need. In addition to the natural filters inside of a Creation of the Sea aquarium to help with the maintenance, we use natural oceanic substances to help stabilize water parameters and maintain a healthy marine ecosystem. Maintaining saltwater aquariums with natural filters and substances provides cost-effective aquarium maintenance solutions for our clients. Also, the data in the APPA 2009-2010 National Pet Owners Survey showed that the laborious maintenance procedures (i.e., algae removal, general cleaning, sand bed cleaning, and keeping the water clean/clear) were some of the leading drawbacks of owning a saltwater aquarium. Due to the natural operation of a Creation of the Sea saltwater aquarium however, clients will experience less algae growths, better water clarity, and cleaner appearance of the aquascape (e.g., sand bed). Our monthly maintenance costs are typically 40%-50% lower in price when compared to the monthly service costs from most aquarium service companies in New Jersey, New York (NY), Connecticut (CT) or the NY Tri-State area. We are currently providing saltwater aquarium maintenance services in northern and central New Jersey (NJ), which includes Warren County, Hunterdon County, Morris County, Somerset County, Sussex County, Passaic County, Mercer County, Monmouth County, Middlesex County, Union County, Essex County, Hudson County and Bergen County. 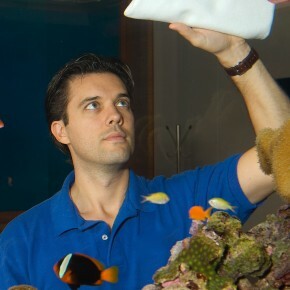 We are also providing saltwater aquarium maintenance services in New York (NY), which includes New York City (NYC), Bronx county, Rockland county, Orange county, and Sullivan county, and Fairfield county of Connecticut (CT), which includes cities such as Greenwich, CT. We also provide 24/7 emergency service. Furthermore, we can also help maintain existing saltwater aquariums that have been installed by other providers or convert any existing saltwater aquarium filtration system into a “Creation of the Sea all-natural aquarium system”. Please contact us via phone at (908) 914-7705 or e-mail at info@creationofthesea.com to learn more about our aquarium maintenance services and pricing.